Of all the many ways in which Caroline Kennedy's brief and unofficial candidacy for the U.S. Senate was mishandled, one final ungraceful note is striking particularly close to home. Sources close to Senator Edward M. Kennedy tell TIME that his circle is furious that his brain cancer has been cited by some in her camp as the reason for her decision to withdraw her name from consideration for the Senate seat being vacated by Hillary Clinton in New York. "He is crazy about her. 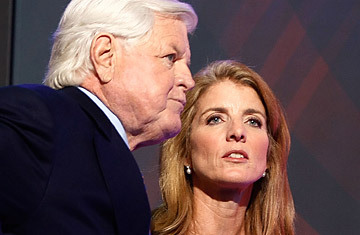 He encouraged her" in her bid for the Senate seat, one close associate says of Ted Kennedy's relationship with his niece. "But using him as an excuse, as though things were on the downward spiral, is not going to be O.K. with him ... This will get in the way of health reform"  by suggesting that a key legislator involved in putting the bill together may be incapacitated. The first reports that Caroline Kennedy had withdrawn her name came early Wednesday evening, and they touched off a frenzied effort by her camp to deny it. Her terse statement, issued shortly after midnight, cited unspecified "personal reasons" for her decision to notify New York Governor David Paterson that she no longer wanted to be considered for the post. Those reports were not denied until shortly after TIME.com initially reported that Senator Kennedy's inner circle was angry at his health being used as a justification for her withdrawal. "It has nothing to do with Senator Kennedy," said an aide to Caroline Kennedy, who previously had not responded to TIME.com's request for comment. Meanwhile, a source close to the Senator added, "The Kennedy people are not upset with the Caroline people, because they know it didn't come from her." However, early Wednesday evening, while she was still mulling her decision, New York news outlets began reporting that she had taken herself out of the running. Caroline Kennedy called Paterson with her final decision after 10 p.m. E.T. Those close to the Kennedy family are appalled at how Caroline's brief political career has fared. "Everything that was special about her got stripped away," says one. But this source, among others, says Caroline, an intensely private person who has made her impact largely through charity and volunteer projects, may not in fact be suited to the rough-and-tumble family business. Paterson has indicated that he will appoint a replacement for Clinton later this week. Read more about Caroline Kennedy's candidacy.